A Plea from our Timps! There will be a SILENT AUCTION ON SATURDAY. Our Musical Director received the Special Achievement Award at the Portsmouth News ‘Guide Awards’ on Monday, 16 November! Congratulations to our Musical Director who received the Special Achievement Award at the King’s Theatre Portsmouth for his outstanding achievement in guiding the Orchestras for almost 50 years. As this is the first Symphony Orchestra concert of the Ferneham Hall season I shall introduce our new Bob Harding Bursary holder, Sam Draper, before he conducts the colourful Mussorgsky Night on the Bare Mountain. Many of you already know Sam from the exciting Hayling Island concert in September when he stood in for Jessica Cottis. He has worked hard in rehearsal and besides the Mussorgsky, Tchaikovsky’s intense dramatic vision of Dante’s Inferno in Francesca da Rimini benefited from Sam’s (and Leader Cathy Mathews’) attention in an invaluable string sectional rehearsal. Rarely have the string players worked so hard as they do in those two works. By contrast Kabalevsky offers us joyous rhythms and melting tunes and we finish with the much-loved symphony of César Franck. This is the 40th anniversary of my first concert with the Orchestras and I cannot imagine a more satisfying mixture of wonderful melodies, drama, excitement and fun for my personal celebration. As promised in the last Newsletter, our President Pauline Buzzing and I are holding the fort with the Friends organisation while we look for a new Friends’ Secretary now that Beryl Harding has stepped back from the front line. Some of our ideas are mentioned below and we hope more of you would like to join up. The Friends of course make a most valuable financial contribution to the Society and in fact are sponsoring this concert for which we are most grateful. There are more ideas to help the funds and for your enjoyment throughout the Newsletter. Please bring your friends along to enjoy the concert and come and join us in the bar afterwards. We would love to hear what you thought of the performance. It’s terribly early and the players have more work to do before the year ends but I wish you all the best for Christmas and for a music-rich New Year. Born in New Zealand, Ben Baker began playing the violin at 3, and at 7 years old he played with Nigel Kennedy who suggested that Ben apply to The Menuhin School. Ben was offered a scholarship when he was 8 and moved to England. Ben is now 19 and is studying at the Royal College of Music. Ben’s musical highlights have included playing concertos by Mozart, Bruch, Tchaikovsky, Vaughan Williams and Mendelssohn in England, Europe and New Zealand. At 15, Ben played Mozart’s Sinfonia Concertante with the London Mozart Players in the presence of Prince Edward. Ben has played at many music festivals including those at Bath, Wisley (with fellow New Zealander Hayley Westenra), Deal, Battle, Montpellier and the Gigli Music Festival in Italy. He has played at all the major London venues and given recitals in Italy, Spain, Portugal, Switzerland, France and New Zealand. In 2007 Ben won the Cathcart Concerto Award to play with the Royal Philharmonic Concert Orchestra at the RAH. The critic, Michael Darvell said of his performance, “At just 17 Ben is obviously destined for great things”. The national radio station, Classic FM, awarded Ben’s solo debut album Arcadian Strings their Next Big Thing prize in 2006 by an overwhelming listeners’ vote. Sit on the edge of your seats on Saturday and be prepared for a period of extreme emotional stimulation from the widely-ranging programme! Tchaikovsky is always good for stirring the musical juices but in Francesca da Rimini he seems to have discovered a special vein of inspiration from Dante’s Inferno. Using the same structural recipe found in his earlier Romeo and Juliet Fantasy Overture (brooding introduction - fiery allegro - tender love-music - doom-ridden final allegro) he unleashes a torrent of unbelievable passion and torment. By contrast, Mussorgsky’s tone-poem (which the composer usually referred to as The Witches) is more of a chiller, being concerned as it is with the Dark Arts - a sort of Russian Danse Macabre whose frenzied progress is similarly halted by a tolling church chime. Our new Bursary Holder, Samuel Draper is relishing the opportunity to conduct this popular and exciting work. Fireworks of a different kind come in the Kabalevsky Violin Concerto where the soloist generates most of the heat in scintillating virtuoso passages. Kabalevsky, who was one of the prominent cultural committee scourges of poor Shostakovich, toes the party line in this concerto with easily assimilated tunes and catchy rhythms, verging at times on boisterous frivolity. Despite the much-reduced orchestra (just single wind) the composer injects periodic flashes of bright colour by employing no less that four percussion players. After such a breathless first half, the Franck Symphony initially offers music of much more grace and grandeur but in the 3rd (and final) movement the mood is metamorphosed quite dramatically with a blaze of exultant glory. For some obscure reason the slow, laboured opening of this symphony reminds me of W B Yeats’ poem The Second Coming where he muses about the Sphinx …. Is moving its slow thighs …..’. Terribly fanciful of me, I know. However this Franck piece also represents the Second Coming of the French (Belgian) Symphony after Berlioz! Music is one of the great consolations as the days become shorter, darker and colder. It looks as though we’re in for a busy spring with all the plans announced elsewhere in this newsletter. All these activities are spin-offs from the orchestra's work over a long period - more than four decades of music making. It's good to know that Peter's leadership and untiring service to music has been recognised. Most of the work takes place at the Tuesday and Friday evening rehearsals, when the rest of us are unaware of the effort Peter and the players put into their practice. The concerts are just the tip of the iceberg - the visible part of their labours. If you have any comments about the work of the orchestra, ideas for activities, views on the programme - what you like and what you don’t, please don’t hesitate to talk to me before, during the interval or after the concert. Irene Waller ATD, FRSA, an internationally known textile designer and author of books on textiles has kindly donated this picture to the Society with the suggestion that it could be used to raise funds. Irene was a senior lecturer at Birmingham College of Art for 15 years and she also freelanced, making large-scale textile works for the church and private customers. Now living in Malvern she took up painting about 20 years ago and works in oils, pastels, charcoal and water colour. 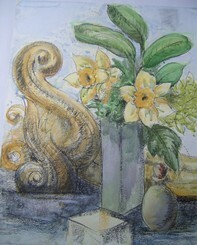 The picture of still life and daffodils is 20" x 16" (51 x 41 cms) and is framed. It will be displayed at Ferneham Hall from 6.15 pm. The Auction will commence at 7.00pm in the Meon Area and bidding will continue until 7.25, recommencing at the Interval and closing 5 minutes before the concert restarts. A Silent Auction involves written bids. If you are over-bid you can continue adding increased amounts until the closing time. The Friends of the Havant Orchestras who, under Beryl Harding’s leadership, have raised substantial sums of money to support us over the years are the sponsors of this concert. Now that Beryl has stood down as Friends’ Secretary our President, Pauline Buzzing, and I have agreed to co-ordinate things until a new leader can be found and we think it would be useful to let you know more about the Friends. The aim of the Friends is firstly to let people come together from time to time for some collective activity, not necessarily musical, and secondly, let’s not beat about the bush, to raise funds for the Orchestras. Each year the Friends raise thousands of pounds from their donations and events. The minimum annual donation is £5 but most Friends give considerably more. Friends are entitled to attend rehearsals and the Bob Harding Bursary auditions in July. They are also invited to join the President and Chairman, and possibly the soloist, during the interval of the concert which they have sponsored. The first event we have planned for the season is unusual as you are all invited to have a taster of Friends’ activities. It will be an afternoon of very varied music given by Becky Hill (leader of the violas in both Orchestras) and friends at 3.00pm on Sunday 24 January 2010 at the Newtown House Hotel in Manor Road on Hayling Island. Refreshments will be served afterwards and those that wish can book an excellent carvery lunch at the Hotel beforehand (tel 023 9246 6131). This is a splendid venue which the Hotel has made available to us at no cost. Tickets for non-Friends cost £8 (by cheque payable to HADOS) and will be available at the concert or from me - either send an email to acg@waitrose.com (preferred), write to me at 23 Grove Road, Havant PO9 1AR or ring 023 9247 4681, leaving a message and contact details if I am not there. In March, a trip to the London Coliseum to see Janacek’s Katya Kabanova when the second of our Bursary holders, Mark Wigglesworth, conducted in a new ENO production by English National Opera. For those who do not know it, Janacek’s music is stunning and of course we expect great things from Mark. If you’re new to opera, and/or if you’d like to do some preparation, Pauline will be giving an afternoon introduction to the themes and characters on Saturday 13 March, 2.00-4.30 at a venue to be decided - depending on participants’ locality! Establishing Friends’ groups in some areas - similar to the Swanmore Super Supporters. This list is not inclusive - your ideas, suggestions and offers of help and venues will be welcome! If you would like to join the Friends you can do this at the concert (at the table in the Foyer). Our 'Upbeat' pre-concert talk on Saturday will be about Tchaikovsky and his music, particularly the ballets which are associated with Christmas. What is the mysterious instrument that plays for the 'Sugar Plum Fairy'? What makes the 'Russian Dance' sound 'Russian'? AND have a go at composing your own piece of 'Sugar Plum' music! There is no joining fee for the Club just bring your youngsters along at 6.30pm on Saturday to meet Becky Hill in the Meon Area. The Sway Handbell Ringers are making their 3rd visit to entertain you. They will be bringing several of their supporters and will be staying for HSO’s performance. We are sure you will give them a warm welcome in the Octagon Lounge and the bar area from 6.55 to 7.15 on Saturday. Kate Hanks, HSO double bass, a member of the Ringers has written this introduction. ‘The team remains much the same but with a bit more playing experience! We continue to try and expand our repertoire and seek always to improve our playing standard. Our long suffering conductor continues to encourage us to ’kill the bells’ to avoid unnecessary lingering sounds and ’to watch the stick’ when the bass and treble ends of the team make a bid for independence! The team played recently in a Handbell Festival Service at Guildford Cathedral organised by the Eastern Region of the Handbell Ringers of Great Britain. We joined with many other teams for massed ringing with organ, trumpet and timpani! There were approximately 180 ringers playing together and it was a very uplifting experience. As we were the team allocated the very back position, the rehearsals were fraught with difficulty. The conductor was a small figure in the distance with a baton that could not be seen. The enormous distance between front and back made keeping together a real challenge. Thank you, Kate - and the team - for coming this considerable distance to serenade us. We hope the team will enjoy our music-making. The Orchestras’ set of three timpani are used in rehearsals and in most concerts (though Nik Knight uses his own set). After many years of hard use the covers which protect them are disintegrating. One needs to be replaced urgently and the others soon. Each will cost just over £100. Nik will be playing in 693 bars at this concert: 220 in the Tchaikovsky; 160 in the Mussorgsky, 116 in the Kabalevsky and 197 in the Franck. Would you be prepared to sponsor some of these bars at 50p per bar, please? The concert sees a great deal of action from the percussion section and you can feel part of it - and protect the timps for many years to come! Sponsor lists will be on the table in the foyer on Saturday. DG 445 596 2GMA ?Mid Price. ‘Colours of the Renaissance’ -Lassus, Phillips and Poulenc plus Anna Pring , violin and an exhibition by Chichester Camera Club. Tickets at the door. ‘Celebrating Christmas’ with seasonal songs and carols, Tickets £8.00; 6.50 (conc), £3 (under 16s), from the Fareham Well; box office 01329-664948 and at the door. Christmas Mystery - seasonal music and well-loved carols. £13.50; £11 concs; Seasons: £54 (£44 concs).